"We are eating prasadam everyday with Swamiji. Prasadam means 'mercy.' 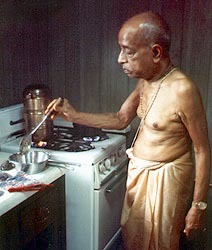 Swamiji expains that we must first prepare food nicely, then offer it to Krishna. Just by glancing at it, Krishna eats it, then leaves everything for us out of mercy. Then we are permitted to eat. "Our method is not dry, Swamiji says as he hands capatis to each disciple. It is full of juice, full of nectar."